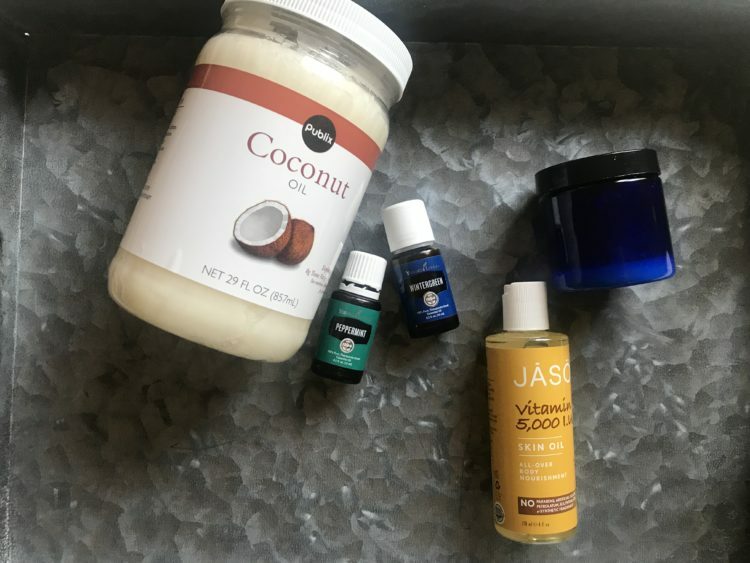 If you are on your feet all day or exercise often or just have plain ole achy, tired feet, this Cooling Homemade Foot Cream Recipe is going to be a favorite of yours! 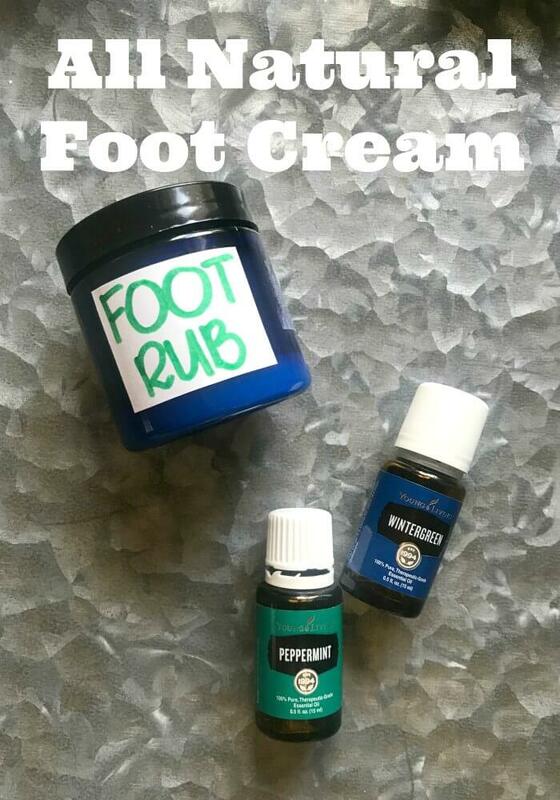 This all natural foot cream is super easy to whip up and is easy to use. It only has a few ingredients (those are the best kind of recipes right?) and you probably already have a few of the items that you need! What I love most about this foot cream is that after a long day, I can sit down to relax and get some all natural relief for my tired and achy feet! It is also very a healing all natural foot cream for cracked heels. I think you will love this recipe as much as I do! Start with your coconut oil and vitamin E oil. Take 1/4 Cup of coconut oil and 1/2 tsp of vitamin E oil and add them to a bowl. Whip together with a fork for 6-8 minutes. 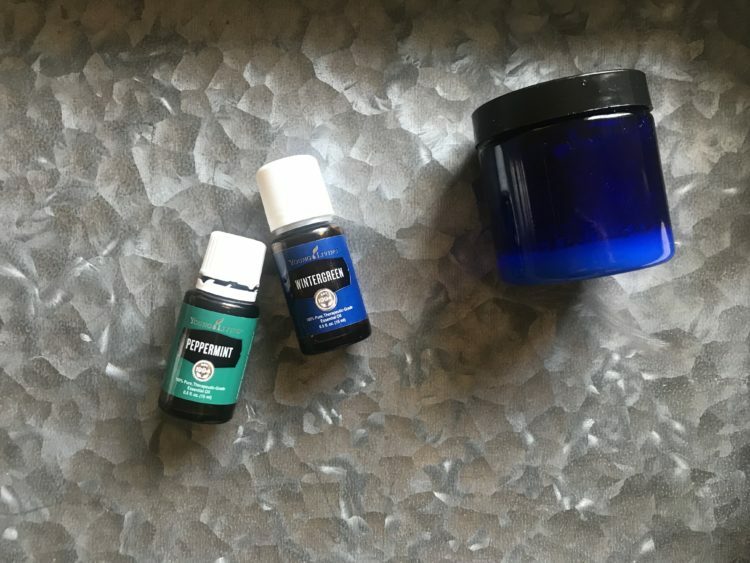 You want to get both of these oils mixed up and make them fluffy. Once mixed together, it’s time to add your essential oils. Add 8 drops of your YL Peppermint essential oils and 8 drops of your Wintergreen essential oil. Mix everything together and them transfer to your jar. Your homemade foot cream is now ready to use! 1. To make feet feel extra good, get a hand towel and soak in water. Ring the water out and place in microwave till warm (30-50 seconds). Wrap the warm towel around oily feet and stick in a bag or bowl to contain the mess while you relax. 2. If you want to go all out for a relaxing foot treatment, first use a homemade foot scrub to get off all the dead skin. Then apply the cooling foot cream for really refreshed feet. This homemade foot cream sure feels nice after a long day! Do you think you would enjoy this at home foot treatment? thanks for this recipe! I recently switched to using eco-friendly products, clothes, food and everything that does not harm nature! This is very important, because we pollute the planet very much, and if we continue, by 2038 there will be a global water shortage and not only this!